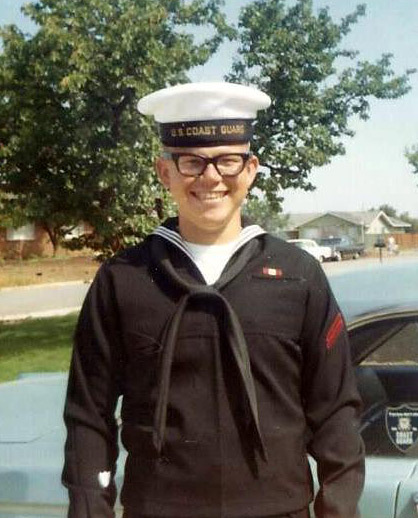 George joined the Coast Guard on March 13, 1967 and served for four years until March 12, 1971. After completing basic training in Alameda, CA, he was stationed on a light ship in the Strait of Juan de Fuca, in Washington. Later assignments included the Coast Guard station at Yaquina Bay in Newport, Oregon and completion of engineman school in Norfolk, Virginia. George served in Vietnam from January 1970 until August of that same year. He was wounded by shrapnel from a mortar round while serving as a liaison officer aboard a boat patrolling the rivers in Cat Lo, Vietnam, Coast Guard Division Thirteen. He was taken off the boat by helicopter and transported to the hospital. He was visited by a Coast Guard officer who awarded him the Purple Heart. After being sent home to recuperate, he was assigned to the Coast Guard station in Los Angeles/Long Beach for the remainder of his time in the Coast Guard. After growing up in nearby Bellflower, George lived in Lakewood from 1973 until he passed away in 2015. After he got married, he and his wife moved to Lakewood. They lived in the same house for 43 years. During this time, they raised two children. They attended schools and school events in Lakewood. They played sports and had birthday parties at the Lakewood parks. Lakewood was a perfect place to live and raise children. His kids attended Stephen Foster Elementary and Mayfair High. He is survived by his wife and two kids, who still reside in Lakewood.